Good afternoon, FCC! Here's another weekly update! WATCH the new sermon series video! I believe strongly in a plurality of elders and pastors for a local church—a plurality of elders and pastors to teach and preach and shepherd. This is why we seek to train up elders in missional communities and elders and pastors for leading, shepherding and preaching and teaching for the whole of FCC. 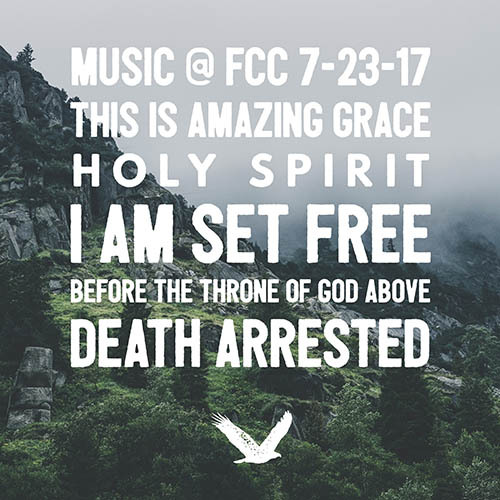 In light of this, Pastor Tim Prince will be preaching again this week on “The Gospel and Freedom” (Romans 8.1-13). Some of the most glorious words of the gospel are recorded in this section of Scripture—“There is, therefore, now no condemnation for those who are in Christ Jesus” (Romans 8.1). Absolutely astounding! FCC’s mission is to make more and better disciples of Christ. Part of living out this mission is working together with other gospel-centered churches through Converge Great Lakes to plant churches. On Sunday, Glenn Herschberger, the Executive Director of Church Planting with Converge Great Lakes will be here in the services. Converge Great Lakes is a district office of Converge Worldwide, which is a network of nearly 1300 churches throughout the United States. Glenn is an experienced church planter, and we look forward to welcoming him to FCC. VACATION BIBLE SCHOOL (VBS) is NEXT WEEK! VBS is open to children entering Kindergarten through entering 5th grade in the fall of 2017. Cost is $15 per child. Registration includes a t-shirt, sciency imagination station equipment, snacks, and one “Cave Quest” CD per family. Online registration is now closed. REGISTER at the DOOR starting at 8:30 am on Monday, July 24! VBS volunteer registration is currently closed. We have received an outpouring of loving and faithful volunteers already, but thank you for your longing to be a blessing to the children of the St. Croix Valley! If you have any questions, please contact Brigitte Feia at bfeia@fcchudson.com or 715.386.4070.